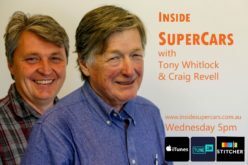 This Week, Tony Whitlock (Racefax) and Garry O’Brien (Auto Action) look at the new race formats for Australia and the Internationals. The costs of racing in the series and will the fans understand all the changes. On this weeks Fujitsu White Flag Lap Scott McLaughlin talks about his start to the series and the win in Melbourne. This Week, Andrew Hawkins (Speed TV) and Garry O’Brien (Auto Action) Preview the support race at the AGP and the OS event formats and how long till Nissan & Erebus are on the pace? along with which rookies made the most impressive debut at Clipsal? On this weeks Fujitsu White Flag Lap Betty Klimenko talks about becoming a V8 Owner and her hopes for 2013. This Week, Adrian Musolino (V8X) and Peter Norton (Inside Motor Sport) review the first race in the New Era of V8 Supercars. On this weeks Fujitsu White Flag Lap Shane Van Gizbergen talks about his schedule and winning the Clipsal 500.